It was feeling more like Fall this week than Summer - temps in the 50s, cloudy, rainy and large pea-size hail, as our local weatherperson, Howard said, 'It seems Mother Nature may be trying to make up for last Winter'. Almost had Rick start a fire in the wood stove today - it's 53 at Noon and 66 in the building - sure doesn't feel like August - J! Well, the Lake hadn't hit the high point for the year, with the rain generated by the thunderboomers, it is almost to the end of the launch ramp. 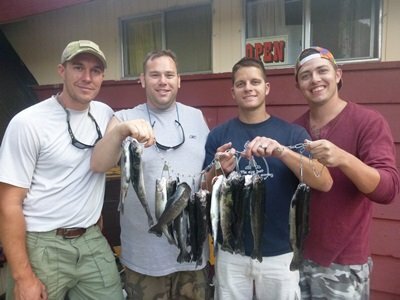 Fishing this week was good for those who braved the weather. Fishing the Inlet's with NightCrawlers & Jigs. Trolling the shore and rock piles with flashers and a NightCrawler or just a swivel, split-shot and NightCrawler (and don't forget that swivel or you'll be hating life) got some nice fish. Shore fishing with NightCrawlers, PowerBait or tossing Lures. 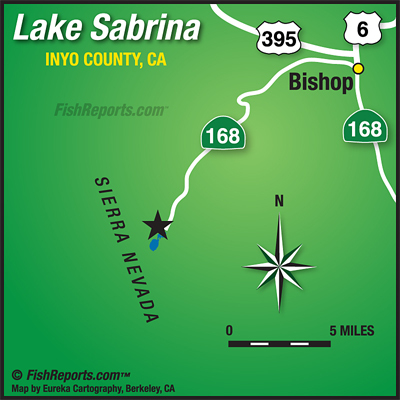 Please mind your manners - if the Inlets are crowded, try fishing the numerous springs feeding the Lake - stop on in and we'll point you in the right direction. Mel Bunnell has been staying at Parcher's Resort for the last 58 years and had taught 4 generations the ins and outs of fishing in Bishop Creek Canyon - last weekend he schooled Dean Dilley and Chad Wittstrom in the finer art of fishing using NightCrawlers and Thomas Buoyants bringing in a few two pounders. CJ Smith reeled in the largest Rainbow this week - a 4 pounder using a Mini-Jig. Jeff Hulse nailed a 3-1/2 pounder using Salmon-Peach PowerBait. Bryana Dunning landed a 3-pounder by means of PowerBait. Tracy Sheres when asked how she caught her first trout stated "caught it with a pole". Jack Gove pulled in a nice 2-1/4 pounder using a NightCrawler. Dan Mahoney with help from Jennifer & Viktoria Priscaro reeled in a 2-1/4 pounder. Thanks again to the Department of Fish and Wildlife for another great load of fish on Tuesday! Lots of rain over the last week, but we should be drying out by the weekend. ThunderBoomers are expected to remain with us at least thru the week so plan according - don't forget your PONCHOS & a JACKET. Temps are expected to be in the mid 50s with the lows in the high 30s - and warming as the rain leaves - DON'T FORGET YOUR JACKETS (can't say this enough)! You can also check out www.weather.gov - enter Aspendell, CA (which is the little community right below Lake Sabrina) in the search field and you'll get the forecast for the higher elevation or take a look at Howard Sheckter, our local weather 'guesser' report at www.MammothWeather.com.